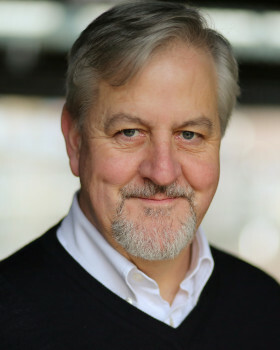 I have been an actor for almost 40 years and in that time have worked in West End shows, regional tours, repertory theatre, television drama, commercials and films. Although I have only recently started to move into the area of voice over I have already been booked to voice several web explainers including a campaign for Age UK, and a new PC game due to be released in 2018. Description of voice: A gentle, deep, warm,reassuring voice. Mature and articulate with confidence and authority. I am also able to offer a number of character voices and accents. Accents: Glasgow, RP, Yorkshire, Norfolk. Singing Strong resonant Bass/baritone singing voice. Very experienced in musical theatre and concerts. Comedy improvisation I am very confident and comfortable with improvisation and comedy. I have performed in a number of pantomimes as Dame and enjoy working with live audiences. The Actors Centre Numerous classes in voice,movement, radio drama etc.